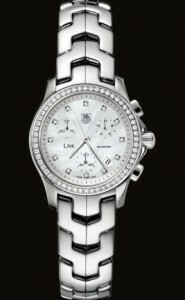 The CJF1314.BA0580 TAG Heuer Link Quartz Chronograph 1/10th Women’s Watch combines equal parts elegance and functionality to create a useful and classy timepiece. The TAG Heuer Link Quartz Chronograph features the best of two worlds: the refinement of the Link collection and the precision of TAG’s chronographs. The dial features 12 Top Wesselton diamonds as the hour markers. Complementing this is the bezel, which features 56 Top Wesselton diamonds. Each timepiece is accompanied with a certificate displaying the quality, size, and carat of the diamonds featured on the watch. The high quality Swiss quartz movement allows the watch to have accurate chronograph functions. Elapsed and total time can be measured, and there is a register for split-second and close consecutive times. Other notable features of the Link Quartz Chronograph include the case, which is cut from a block of solid stainless steel and has shaped push buttons. It boasts a curved scratch resistant sapphire crystal and a water resistance up to 200 meters. 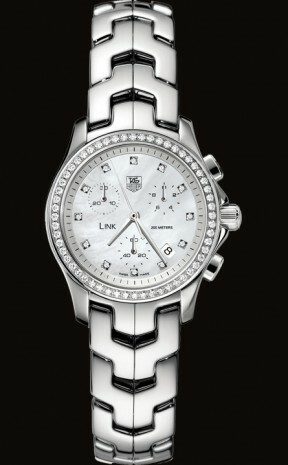 The watch can come with either a stainless steel S-link bracelet or an enamel calf leather strap. The TAG Heuer Link Quartz Chronograph is a perfect watch for the sophisticated woman who has a need for action, as it transfers seamlessly from the track to the 4-star restaurant.